A stained glass studio out of St. Louis, Missouri, produced the many stained-glass windows in Sacred Heart. One of the most striking is the large rose window, “the Window of Creation,” over the choir loft. The eight petals of the rose tell the creation of the world, as well as the angels, through tiny segments of deep blue. Photos by Collin Richie. 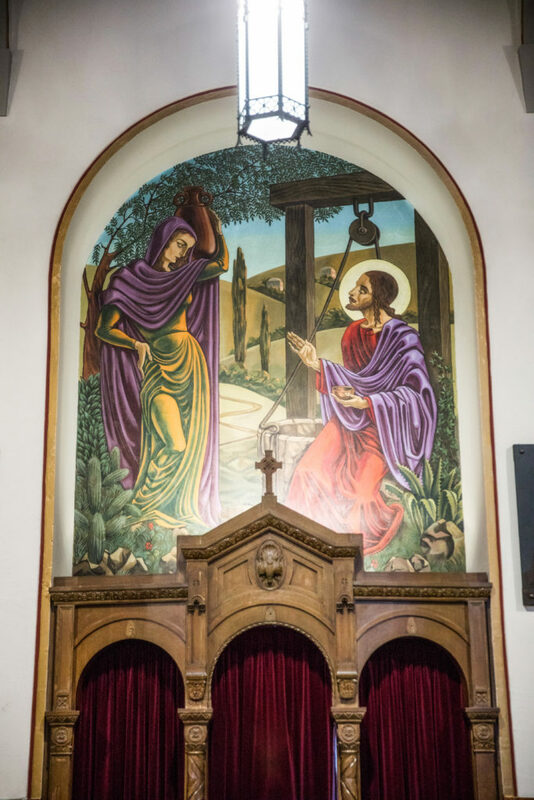 Dutch painter and Benedictine monk Dom Gregory deWit came in during construction in the early 1940s to paint several murals, the largest of which looms over the sanctuary. 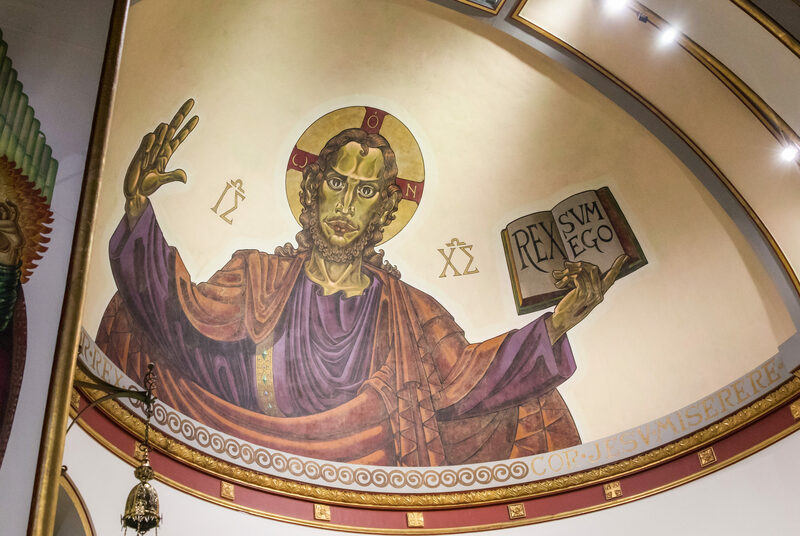 Known as the Pantocrator, it’s a representation of Christ as the all-powerful ruler. The monk was inspired by Byzantine mosaics in Italy and Sicily. His figures bear Sicilian features, such as deep eyes and olive skin. The mural is the stuff of legend for parishioners, who remember being fearful as children of its gaze. 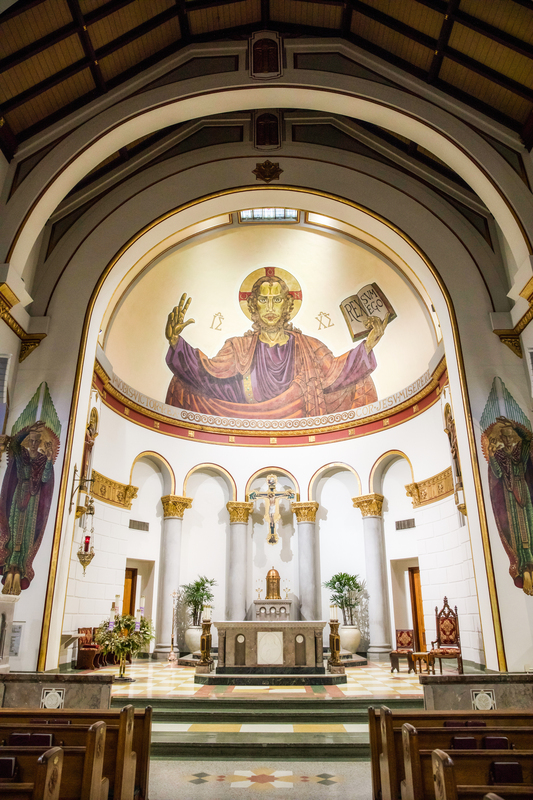 “But I think more and more over the years, the parishioners and the people that approach it with an open mind come to feel like it’s the soul of this building—and kind of the soul of our parish,” says historian, artist and Sacred Heart parishioner Mary Lee Eggart. While restorations of most of the murals were done in the ’70s and again in the early ’00s, the Pantocrator has been difficult to stabilize. The dome is so close to the roof that moisture is a constant problem. Eggart says the church is looking at grants to help conserve the mural. Left: DeWit was “a bit larger than life,” according to Eggart. “You either loved him or you hated him … and people feel the same way about his paintings.” Over one of the confessionals in the nave is deWit’s mural, “The Samaritan Woman at the Well.” It’s based on a passage in the Gospel where Jesus meets her and discloses his knowledge of her marital sins. DeWit’s suggestive depiction of the Samaritan woman with her exposed thigh didn’t sit well with some parishioners. Eggart says controversy over the mural—plus the monk’s often temperamental nature—may have helped cut his time short at the church. Right: A recognizable depiction of Mary holding Jesus after his crucifixion is flanked on either side by more modern figures. 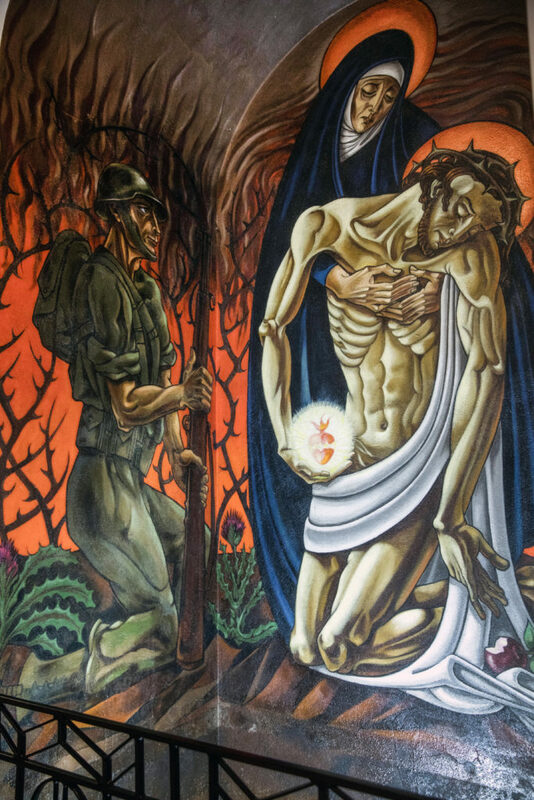 To the left, deWit painted a World War II soldier, and to the right, the soldier’s family. The bombing of Pearl Harbor happened as the church was being constructed, so the war was on parishioners’ minds as their sons and husbands went overseas. DeWit had arrived in the states in the ’30s to paint at an abbey in Indiana, but the war stranded him in America. He busied himself with other projects, including Sacred Heart. 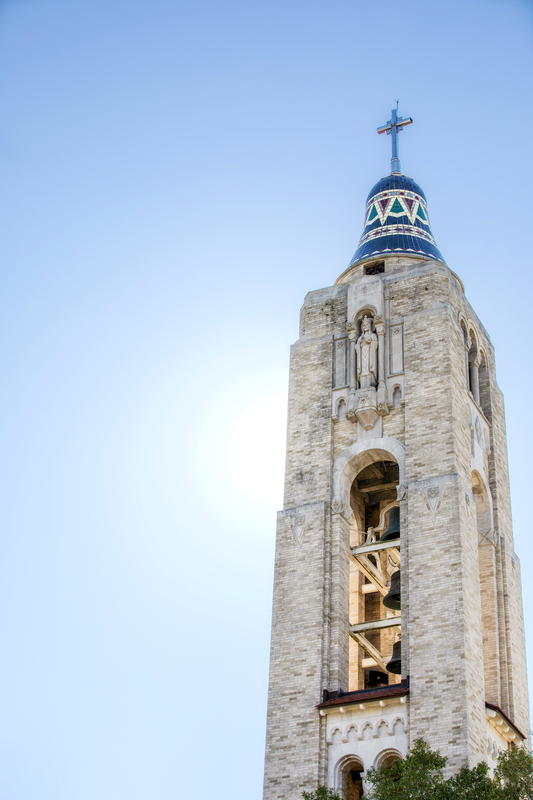 More than 1,600 Italian tiles were carefully arranged on the cupola of the bell tower by a daring local artisan who accessed it by climbing a ladder more than 100 feet up. All the tiles are still firmly in place today. 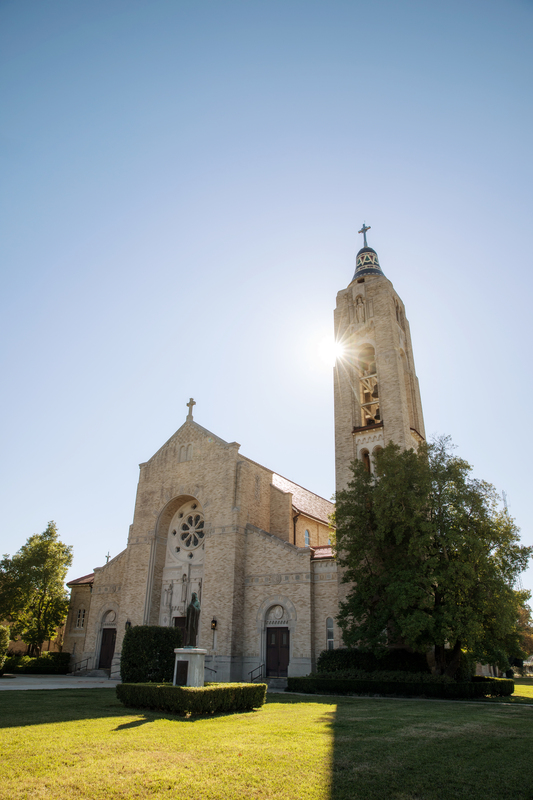 Facing north, the Christ the King statue stands eight feet high and is carved from solid limestone. It was hoisted up to its niche using pulleys.